Dorothy Zbornak, played by Bea Arthur, is "the smart one" of The Girls. 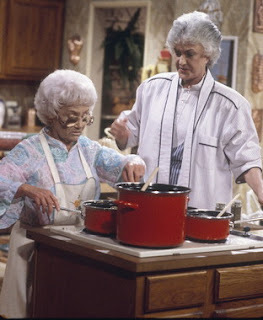 She is snappy and sassy but more Brooklyn than her mother Sophia Petrillo. In The Golden Girls she is recently divorced to her husband of 38 years Stan Zbornak. She is a substitute teacher who loves to read. 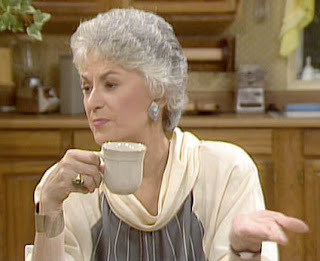 Often she is made fun of by the Blanche, Rose, and even her mom for not going out on dates as frequently as a single woman probably should. However she normally gets back at all of them by calling out on a flaw of their own, making them appreciate her by saving their butts from a jam or offering a smart solution to their problems. 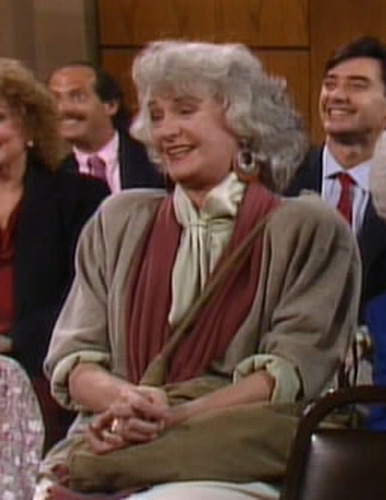 In this picture, from one of my FAVORITE episodes EVER (Goodbye Mr. Gordon), she is wearing a scarf. In the pictures below she is wearing a sweater and a men's style shirt over her tops. She sometimes plays up the masculine style by wearing a bow tie. 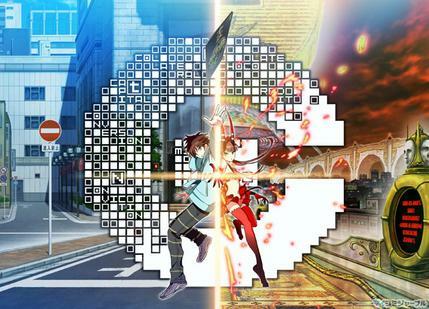 In the second picture below this, you see she even does it for formal wear. 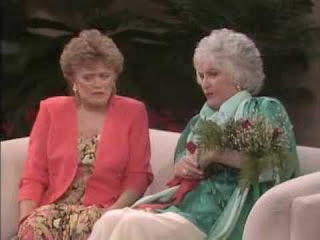 Another one of Dorothy's common outfit picks is a cowl neck shirt. It is like the draping of a scarf, just without the tails. She often wears maxi skirts (see above photo) or wide legged, khaki or cotton trousers. She is rarely seen in heels. Dorothy mainly wears flat sandals. The outfit on the left is what I would wear. Like I have said before, It's HOT here. So to keep with the Dorothy khaki, masculine, wide pants theme I would wear khaki, wide, bloomer style shorts. Also I would wear her trademark draped, cowl-neck by wearing a cowl-neck tank top. This would be under a slouchy boyfriend blazer. To be Dorothy like in footwear I would wear a flat sandal. To pay a tribute to her bow tie I would accessorize with a bow tie necklace. Women rockin the masculine theme was ALL OVER the runway for Spring/Summer 2010 so I can see young, trendy Dorothy Zbornak wearing boyfriend jeans with a loose top. She would not wear anything to tight or too short. I chose the top because, to me, the big bow is an alternative to the bow tie. Also I can see her wearing a bow headband instead of a bow tie too. Instead of sandals with these pants I gave her some boat shoes. 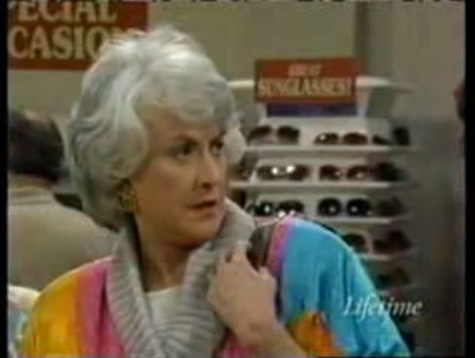 What would you wear to emulate Dorothy Zbornak? What would you see her trend following self wearing? 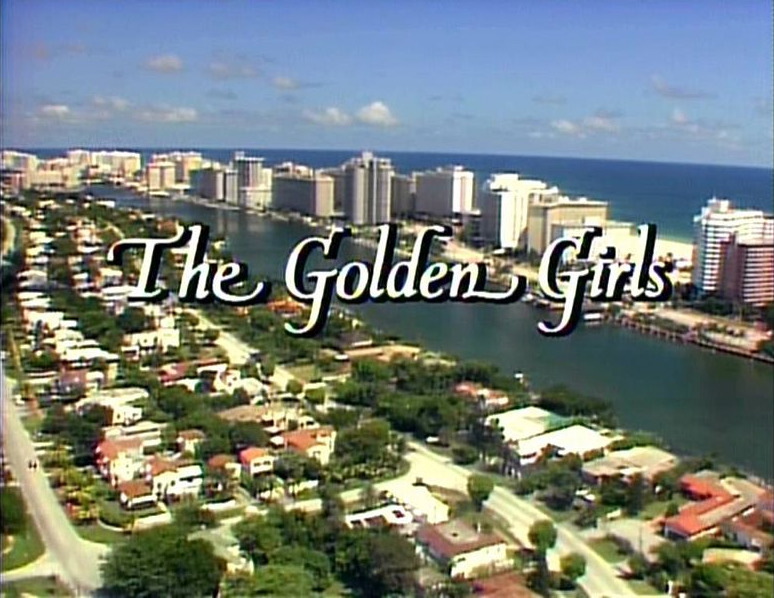 Are you a Golden Girls fan? I'd love to hear from you!!! Great post! And love the outfits.. great interpretation of Dorothy's style. I recently did a post on Blanche's style.. I want to be just like them when I'm that age! now im just a-creepin on your blog! 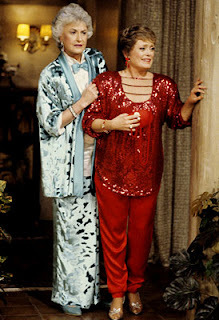 but this is an awesome series of inspirations for looks, I wish I had gotten into Golden Girls :-( maybe someday I'll grab a dvd.